Former Microsoft chief executive Steve Ballmer may have loved basketball so much that he bought the L.A. Clippers. But it’s the current CEO, Satya Nadella, who’s showing that he can pick the winners of the NCAA Tournament better than his predictive search engine, Bing. To add to Microsoft’s dismay, Google’s been more accurate than Bing in predicting the winners of the annual “March Madness” competition. 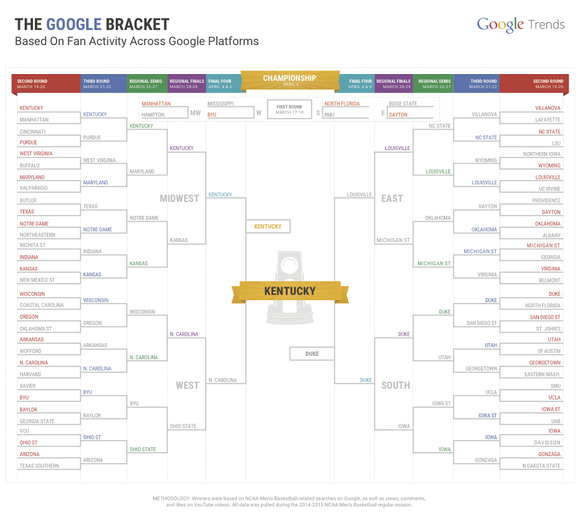 And a Google spokesman—ulp!—says that the bracket is just based on fan activity, and is not designed to be predictive. Except that it’s still doing a better job than Bing. Google’s bracket just uses likes and pageviews to pick its winners. And do you know what? It’s working. Neither has come close to Nadella, however, an Indian-American chief executive with a stated love of cricket, not basketball. 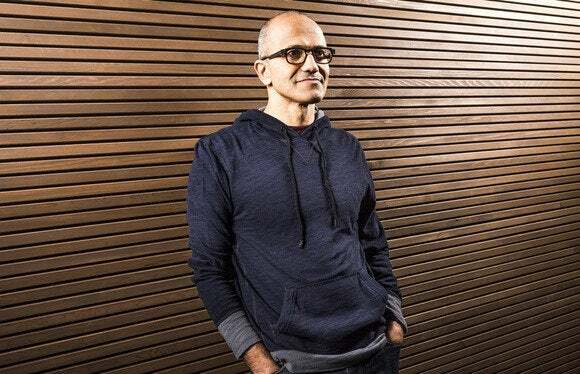 But Nadella has picked 37 winners accurately, easily topping both search algorithms—as well as basketball fan President Barack Obama, who has only picked 33 winners correctly. Why this matters: This is about bragging rights, pure and simple. While Microsoft organized interviews with reporters announcing its Bing Bracket Builder, Google quietly alerted reporters that the bracket had been published to its Google+ account. It has to rankle Bing’s engineers that Google appears to be using Google Trends social cues, rather than historical data, to pick its winners—and that it’s working. As for Nadella—no disrespect intended, but having your CEO outperform your predictive technology is like discovering your kindergartener knows more about your investment portfolio than you do. In search, Google and Microsoft are age-old rivals, used to trying to find the most accurate results in the shortest time possible. In 2010, the game changed: Google launched Google Instant, now known as autocomplete, which attempted to predict search terms as you typed them. Both Bing and Google now try to anticipate everything from the time your flight leaves to what music you’ll want to listen to next. Meanwhile, Microsoft has thrown its predictive abilities at everything from the World Cup to NFL football to the Oscars. For March Madness Microsoft partnered with the NCAA, absorbing ten years of data to allow Bing to make predictions on a game-by-game basis. Every game, Microsoft has published detailed data, even explaining what a team has to do—such as hit more than 40 percent of its three-point shots—in order to win. Google has taken a different approach, picking its winners on the number of NCAA basketball-related searches on Google, plus likes, comments and views on related YouTube videos during the regular season. That still doesn’t explain how Nadella could surpass Bing, however. We asked for comment more than a day ago, but Microsoft has yet to respond. The NCAA tournament began March 19, when the so-called “First Four” games were played, a play-in round to determine four at-large berths in the tournament. Google and Bing identified only one winner correctly out of all four games—Dayton over Boise State—while Nadella nailed them all. That helped him considerably. As it turns out, however, it’s Google that seems poised to run the clock down on Bing. Although Google missed three out of the First Four games, the low-ranked teams all fell to their top-seeded opponents, who went on to win as expected. As a result, Google has gone on to pick certain sections of its bracket absolutely perfectly, including the quarter of the tournament played in the East Region. It predicted the upsets by NC State over Villanova, as well as Michigan State’s upset over Virginia. It’s nice to know, though, that of the five celebrity ballots Bing published, an authentic basketball player actually leads the others: Golden State Warriors small forward Harrison Barnes, who has picked 39 winners correctly. But as we move to the final rounds of the tournament, it’s the geeks in Bing’s back room that will have to make the halftime adjustments just to have a tiny chance of remaining in the game. Updated at 3:12 PM on March 26 with additional comments from Google.